First off… I know what you’re thinking. Maybe you’re worried it will be too hard, too expensive, or too time consuming. I know what these worries feel like. 5 years ago I was preparing to leave Corporate America and starting to explore new ways to earn a living. I knew nothing about building websites or online marketing. I simply wanted more freedom in my daily life. I didn’t want to spend my life sitting in an office, waiting for weekends and dreaming about my extremely limited vacation days. I wanted to pursue life my own way. I wanted to feel alive every day and know I was making a difference. Only tech wizards can create websites. Websites are too expensive to run. My website will never be successful. Or the worst one… I’m not smart enough to create a website in the first place. Despite all of my doubts, I looked past fear and dove in head first. I started researching how to create websites and the basics of online marketing and I asked some of my more tech savvy friends for advice. Luckily, I learned about WordPress.com right away which alleviated most of my fears about creating a website. WordPress is a tool that makes creating a website EASY. You don’t need to learn how to code, you just “drag and drop” things where you want them. This gave me some confidence to go deeper. Soon I found out how inexpensive owning a website can be. I could pay as little as $10/month for a beautiful website to serve my needs. WOW. This could work out after all. Anne and I have been traveling the world teaching yoga for 4+ years while earning an income from our website. Building websites is not as hard or as expensive as people think. If we can do it, so can you. 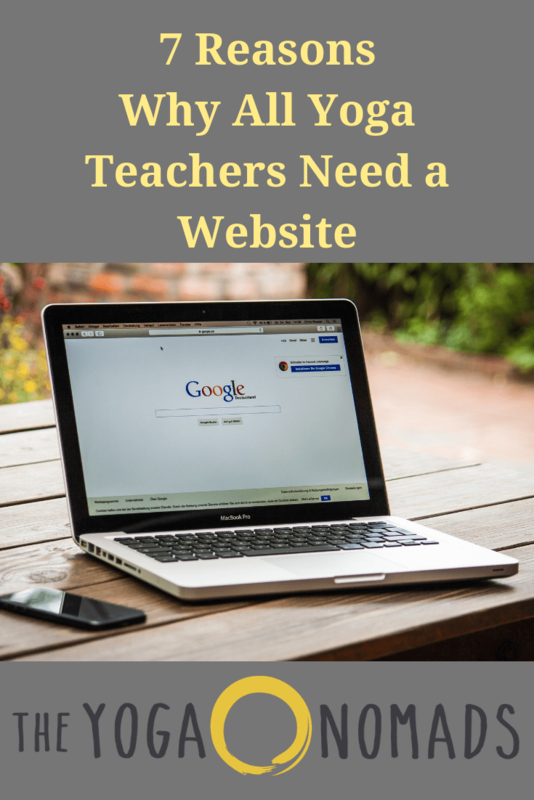 Do yoga teachers really need a website? The world is becoming saturated with yoga teachers. More than 15,000 people graduate from teacher training each year (source). Yoga teachers desperately need any advantage they can get to stand out from their peers. A website is a small investment in your future. When a person is interested in something, the first thing they do is Google it. 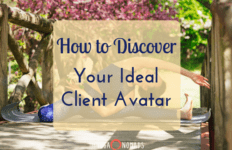 A yoga teacher’s website is their resume, brand, and a marketing vehicle all rolled into one. I know it’s intimidating to think about. I went through the same self doubts back in 2013 when we first built this site. Luckily there are tons of resources online to help – some free ones and, some premium courses that cost money. Although it wasn’t always easy, building our website opened so many doors for our business and overall life. We’ve received offers to teach yoga all over the world, built deep relationships with our readers, met countless yoga rockstars, helped thousands of people pursue their dreams, and started earning a full time income all due to our website. *Full disclosure: we spent a ton of time working on our website to get it to this point. You don’t need something complex to get started. If you’re a yoga teacher who wants to improve your business – a simple website will be perfect for you. Okay let’s get to it. 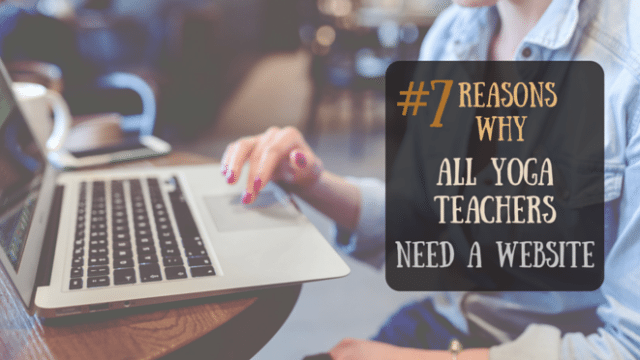 Here are 7 reasons why all yoga teachers need a website. Having a website is especially important when you’re applying for a yoga teaching job. The website instantly builds credibility and sets you apart from your peers. When applying for a teaching job (or any job now days), a simple paper resume falls short. These days, it goes a long way to have a solid online presence. Making a website or a resume landing page with great photos and savvy writing can help a lot. A website shows potential employers that you’ve invested in your career and you take teaching yoga seriously. It also gives them a little taste of your personal style. Bonus points: From an employer’s perspective – having a website implies that you have a larger following and will attract more students to the studio. Teachers with larger followings bring in more students, which means more income for the studio. It’s all about people. This cannot be overstated. Think back to the last couple jobs you got… did you get them because you blindly submitted an application online? No, probably not, because that rarely works. I’m guessing you got that job because someone you know either alerted you of the job or helped you connect with the right people. Your website allows you to easily connect with other people in the industry. Instead of being a random girl named Jane, you are Jane from YogaRockstar.com which comes with a higher perceived value. Our favorite way to build a relationship other yogis is to first publish an interview of them on our website. It shows we’re interested in learning about them (which we are) and also provides value to them in the form of web traffic and an inbound link. After networking with the yoga industry – imagine all the new connections (and friends) you will meet. These connections will help you advance in your yoga career faster and have more fun along the way! We all want to form deeper relationships with our students. It can be challenging to attract new students and build deep relationships while living our daily lives. Especially because we only have so many hours in a day. The two biggest constraints to building more relationships is time and location. You simply cannot meet with 100 people in person every day. And you definitely cannot be in two places at once which means your student base will be limited to your home city. The beautiful thing about a website is you can publish one article that gets read by 1,556,970 people. Imagine how long it would take to reach that many people without a website? Let’s say a student comes to your class a few times and wants to learn more about you and your teachings. You can now direct them to your website which is filled with your philosophy on yoga. After they spend time reading your thoughts on yoga – they will undoubtedly feel more connected to you. Ok, but how does a website get more people to my class? Let’s say a student gets a recommendation to take your class. First thing that student will do is google your name to try and find your teaching schedule. 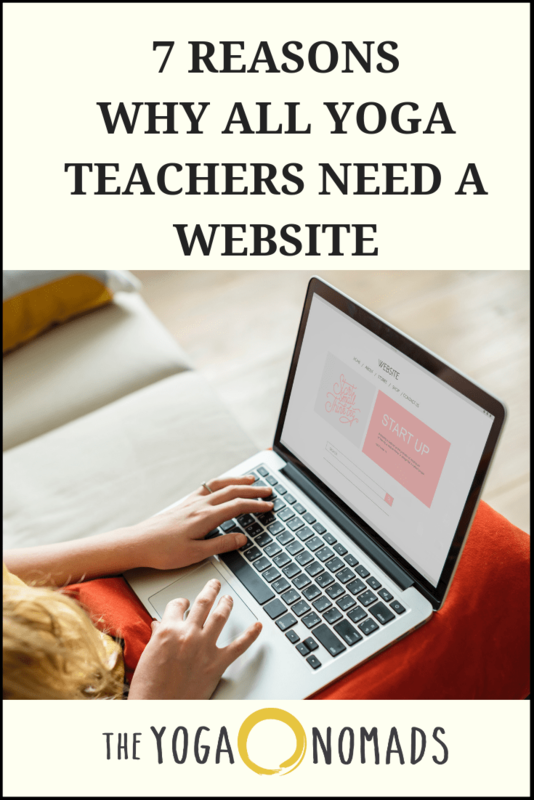 If you don’t have a website – you could have lost a potential student all because you didn’t put in a little effort to set up a website. Most yoga teachers don’t only teach at one specific place. I’m assuming you teach at a few different places? What if you start teaching at a new studio – how will your old students find you? Having a simple website will increase your average class size by keeping your students informed of your teaching schedule! The most effective type online marketing is email marketing. The best way to collect email addresses is by having a website where you can direct your students and collect their email address. Think of your email list as your tribe. 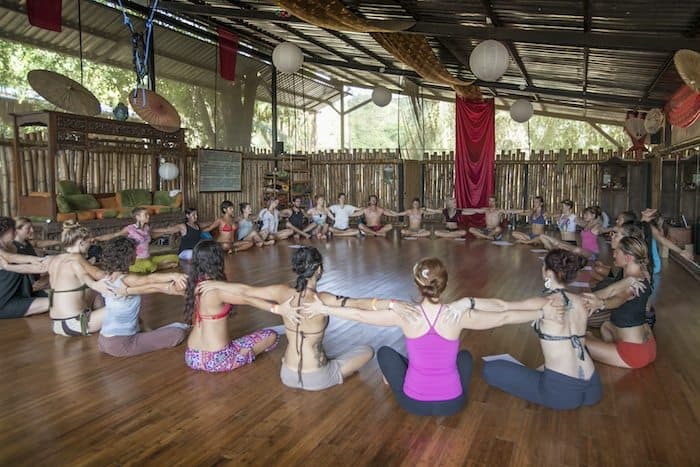 These are the dedicated students who will someday attend your yoga retreat in Costa Rica or buy your book. They will be the first people you tell when you start teaching at a new studio. How do you actually “collect” the email address? First you need a service that keeps track of your email list and allows you to send mass emails to your tribe. The two popular ones for beginners are AWebber and Mailchimp. We have tried both but recommend Mailchimp because it’s free to get started. Update: we outgrew Mailchimp and AWebber and now use Drip for our email marketing. Then you insert an “opt-in form” on your website which is essentially a place for your reader to submit their email address. Easy. It’s a good idea to give something away for free in exchange for some ones email addresses. This free gift is called a “lead magnet” and should be valuable for your target market. For example, if you sign up for our email newsletter you will receive a free guide “Beginners Guide to Creating a Yoga Website: 7 Simple Steps” for free! Having your own website allows you to attract new students in a cost effective manner. When someone googles “yoga teachers in your city” – your website can appear. Anytime you publish a blog post it’s an opportunity for new students to find and connect with you. Maybe you write something that a student really resonates with and they share your article on social media. Who knows how far and wide your online yoga teachings will travel. First off, of COURSE yoga is not about making money. However, as professionals, yoga teachers deserve to be compensated for the value they create in this world. Your website can be used to build your community online and market your retreats/workshops. Disclaimer: it’s not easy nor guaranteed to earn a sizable income but it’s possible. Let me say it one more time… You need to put in a large amount of work on the front end before seeing any income. Oh, you’re still reading? Ok, here are just a couple ways you can earn an income from your yoga website/blog. Affiliate Marketing – When you recommend a product/service online and one of your readers ends up buying that product/service you earn a small commission. Commissions are typically small and real income only comes with large amounts of traffic. Selling Banner Ads – If your websites start to get enough traffic you can sell small ads that appear on your website. Sizable income comes when you have a massive amount of traffic. Selling an eBook – If you feel confident that you have a story to tell, you could write an eBook and sell it through your website. Create one book and sell it a thousand times. Selling a course – If you consider yourself an expert at something, it might make sense for you to build a course teaching other people to do that something. Not only are you solving real problems for real people but it’s also an effective way to earn an income. Building a simple yoga teacher website is not hard. However, it does require time to teach yourself the basics and some good old fashioned elbow grease. The first thing you want to consider is what is the point of your website? Is it a simple online yoga resume style? Or are you trying to create a blog and become the next Elephant Journal? All yoga teachers need a website, but not all yoga teachers need to create a complex website like Elephant Journal. A domain name is your website’s address, www.JaneDoeYoga.com would be an example of a domain name. It only costs $10/year to purchase your own domain name. There are many websites you can use to choose a domain, we use and recommend BlueHost for both domain names and hosting. After you know the name of your website, the next thing you need is web hosting. Hosting is essentially paying for a house for your website to live in. Luckily rent is cheap for websites, you can pay as little at $3.95/month to host your site. If you use BlueHost for hosting, they will even toss in a free domain name! This is what normal people (ie: non computer programmers) use to manage a website. It makes it very easy for anyone to run a website. There is no computer programming required. They are simple “drag and drop” systems. The most popular and our top recommendations in WordPress. We use WordPress for all of our websites and cannot imagine changing. WordPress is perfect for small businesses because it’s so easy to use and it’s also very scalable for huge websites like the Huffington Post. Alright, just use WordPress, OK? A theme is a template that dictates what your website will look like. There are 1,000s of different themes for all types of websites. To keep it simple, pick a popular, responsive, theme with a design that suites your needs. Many themes are free and others charge a one time fee of around $50 USD. We recommend using Elegant Themes. It worth the investment to get a premium theme, however not required. Add your favorite pictures, an “about me” section, your class schedule, etc. You can choose your favorite color schemes, customize your menu bar, and much much more. Start with the basics. Is having a Facebook and/or Instagram account good enough? No. Of course it’s better than having nothing but it’s not good enough. Social Media is just one branch of the online marketing tree. Besides, most people can set up a social media account in a couple minutes. Remember the importance of differentiating yourself. Having your own website shows that you take yourself serious. If you don’t take yourself serious, why should anyone else? Can I just create a free website? Yes, you can create a free website, but it’s not a good idea. Sure it’s cheaper on the front end, but free websites really limit yourself. 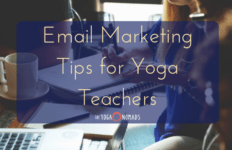 If you’re going to spend your time teaching yoga and marketing yourself as a yoga teacher – it makes sense to spend a little money and effort to create a website. Besides having your own website is very cheap – as little as $5/month.